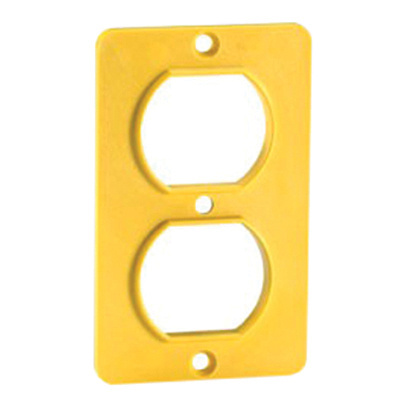 Leviton 1-Gang Standard coverplate in yellow color, features polycarbonate construction. The rectangle coverplate has dimensions of 2.25-Inch x 0.205-Inch x 3.65-Inch. It has one duplex receptacle configuration. Coverplate offers vertical orientation. It is suitable for use On 3000 Series portable outlet box It withstands temperature rating of -40 to 100 deg C. Coverplate is UL listed and RoHS compliant.